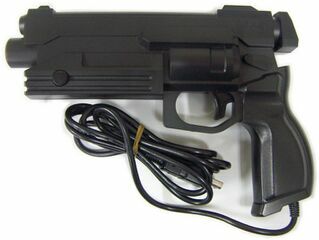 The Virtua Gun, known as the Stunner in North America, is the official light-gun peripheral for the Sega Saturn. As the name might suggest, the Virtua Gun was built for Virtua Cop and Virtua Cop 2 in mind, and was bundled with these games as a result (though it was also available separately). It was also bundled with The House of the Dead in Europe and Asia. Japanese Virtua Guns are black, European models are blue and North American models are red. At the time, many light-gun peripherals were forced to use bright colours or non-realistic designs due to fears that it they could be linked with gun crime. Main article: Virtua Gun/Magazine articles.